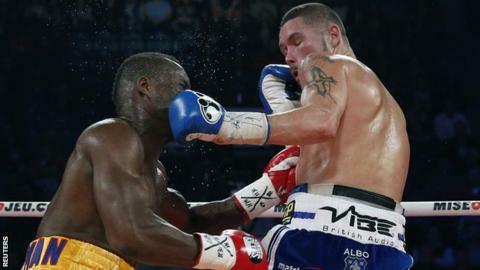 Britain's Tony Bellew was stopped in the sixth round by Canada's Adonis Stevenson in their WBC light-heavyweight title fight in Quebec City. After Bellew, 31, was dropped by a heavy left to the jaw, the referee ended it as the Liverpudlian challenger came under a barrage of blows. There had been an ill-tempered build-up to the fight but 36-year-old Stevenson had too much power for his rival. "I gave it everything and the better man won. Gutted," Bellew tweeted. "The fans who travelled, I'll be forever in your debt. I'm truly shocked. Like I said the better man won, no excuses. Thanks again for the support." Bellew drew blood from Stevenson's nose early in the third round but had to take some punishing blows from the champion's big left hand. Stevenson went down after an exchange in the fourth but referee Michael Griffin ruled that it was a slip. The Canadian then caught Bellew with a right to the ribs to set up the left-hand blow which sent his rival to the canvas before the fight was stopped. It was Bellew's second defeat in a 23-fight career, following his 2011 loss to Wales' Nathan Cleverly. He has now lost both of his world title shots. For Haitian-born Stevenson, 36, it was his fourth knockout victory of 2013, after wins over Darnell Boone; a one-punch, first-round knockout of Chad Dawson to win the title; Tavoris Cloud; and Bellew. "He said I'm a dwarf, and the dwarf knocked him out," Stevenson said. "I told him, when he's going to feel my power, I'm going to drop him out." On the same card in Quebec City, Russian Sergey Kovalev inflicted a second-round knockout on Ukrainian Ismayl Sillakh in their light-heavyweight contest. Kovalev beat Cleverly in August to win the WBO title and twice floored his opponent in the second to remain unbeaten in 23 fights, 21 by knockout, with one draw.